After leaving Lake Abbe on our Djibouti adventure, we headed in the 4×4’s across the Great Barra to Dikhil region to trek across the Danakil Desert to the beautiful salt plains of Lake Assal. 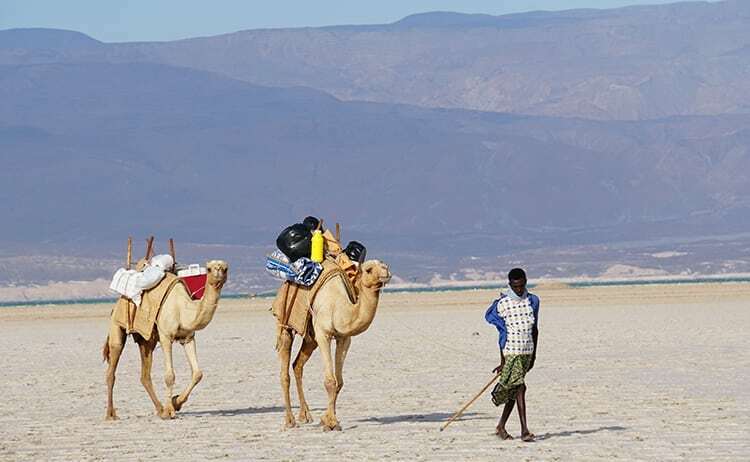 Also, known as the honey lake, it is a saline lake which lies 155 m (509 ft) below sea level in the Afar Triangle, making it the lowest point on land in Africa and the third-lowest point on Earth after the Sea of Galilee and the Dead Sea. This area is one of the hottest places on earth, the underground of the Lake Assal keeps evaporating adding to the density of the salt bed. Following our experience of sunset and sunrise by the chimneys of Lake Abbe, our journey took us back along the very rocky path to Dikhil where standard lunch was served… tuna salad to start, followed by fried chicken, rice and chips with crepes and Nutella to finish. 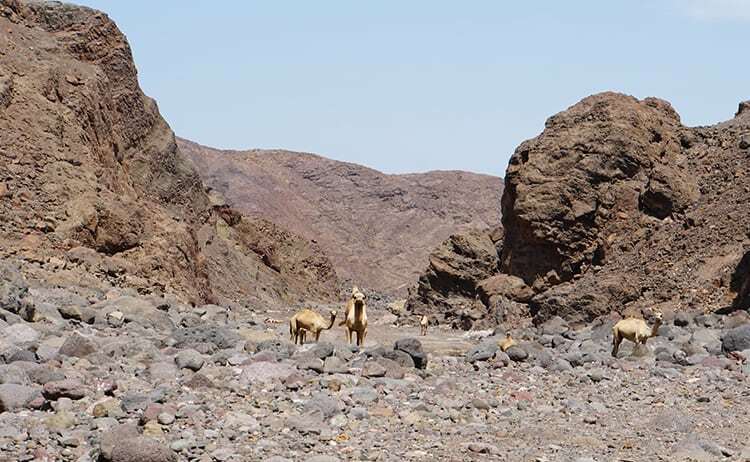 Having refuelled, we travelled in the 4×4 around 3 hours to get to the Wadi Abbe Bad where we set up our bivouac for the night. We fell asleep on our beds to the sight of the stars in the clear sky, one of my favourite things to do. Woke up to the camels making some very strange noises, the group starting to shuffle around, packing or finding a ‘good’ toilet spot. Breakfast was served, fried bread and Nutella with fruit on the side. Word must’ve got round the local Afari settlement as the kids came over to watch us. 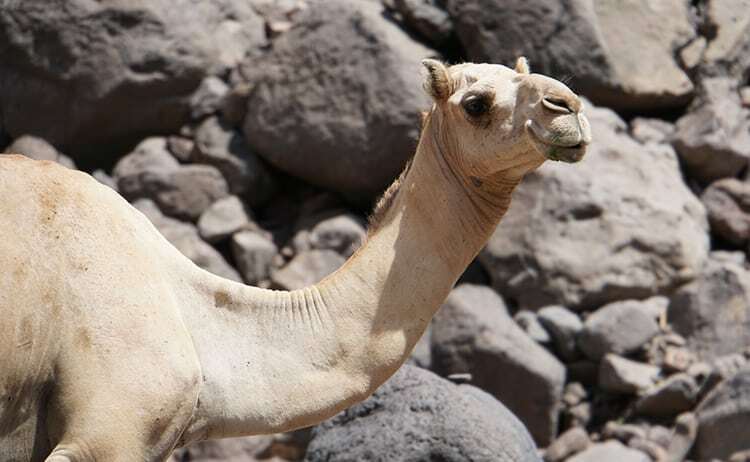 The trek through the Danakil desert was nothing but volcanic rocks. It was a pleasant walk, without much climbing or stamina required. We came across a wadi pool which was perfect timing as the day was starting to heat up, very refreshing but made sure I kept my mouth shut as I jumped in, the water was rather green. Just around the corner was our eating spot. The camels had gone ahead with the Afari chef who had started cooking feast of, yes, you guessed it, tuna salad to start, followed by fried chicken and rice. Mats had been laid out in the shade of the rocks away from the midday sun, we moved into a cave for a post-lunch siesta till the day cooled down a little. 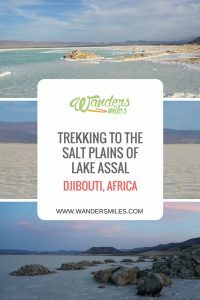 Our trek continued for a couple of hours through black lava fields with dormant volcanos and as we neared the end, the vision of the bright white salt plains of Lake Assal glistened in the sun with the saline waters a rainbow of emeralds and baby blues. My mind was actually blown! We organised our bags and beds and headed down to the water for a swim at sunset… or float should I say! Whilst the saline waters did make you buoyant, I felt it was more so on my visit to the Dead Sea. Make sure you bring thick shoes for the walk down to the lake to avoid ripping your feet to shreds. Our bivouac had been set up behind a row of rocks in an attempt to shield from the strong winds. The 4x4s has been strategically placed around the dinner table so our food didn’t take flight. The pinky-peachy sunset across the white plains was a beauty then we were rewarded with another night gazing at the stars in the clear sky. Always make travel insurance a priority for any adventure! World Nomads is my go-to guys, I’ve learnt this from experience. 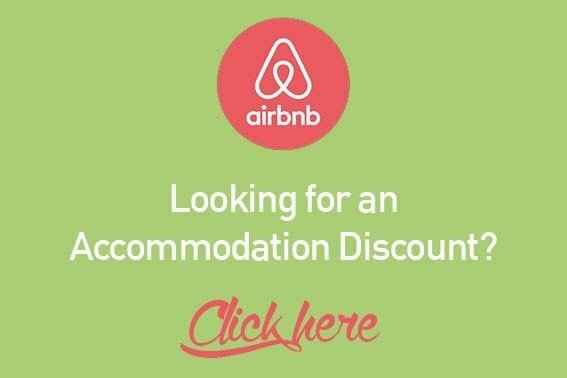 You can buy and claim online even when you’ve left home. I love that they give a little back too and support community development projects in various countries. Are you stating the dead sea floats you more than this lake? How was the mud bath, did you partake in this? Did it leave your skin feeling different? When I was in the Dead Sea, I did feel like you were more buoyant than in Lake Assal, not by much though! And yes, I covered myself in the mud at the Dead Sea, my skin felt super soft afterwards! Thank you so much for the reply. Great site you have given us of your travels. 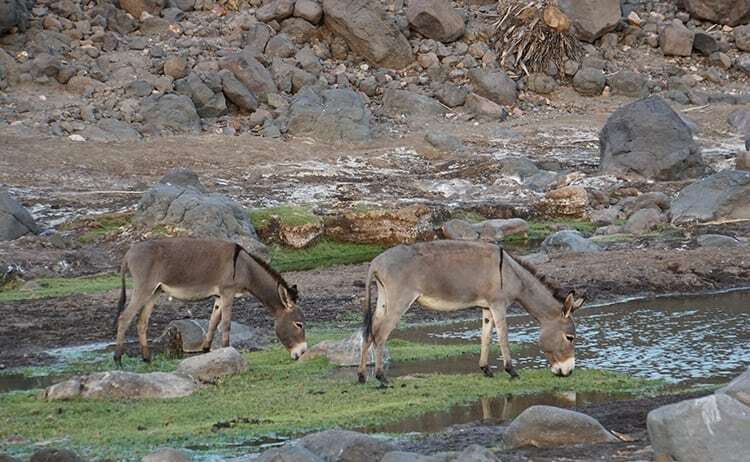 When you were at the Assal lake, did you cover yourself in mud there also? Did you feel the mud there had the same feeling as when in the Dead Sea? I was just curious as both bodies of water are lowest points on the continent and with high salinity levels. There is no mud at Lake Assal, it’s purely salt plains surrounded by volcanic landscape around it. Thank you for the compliment about my site! 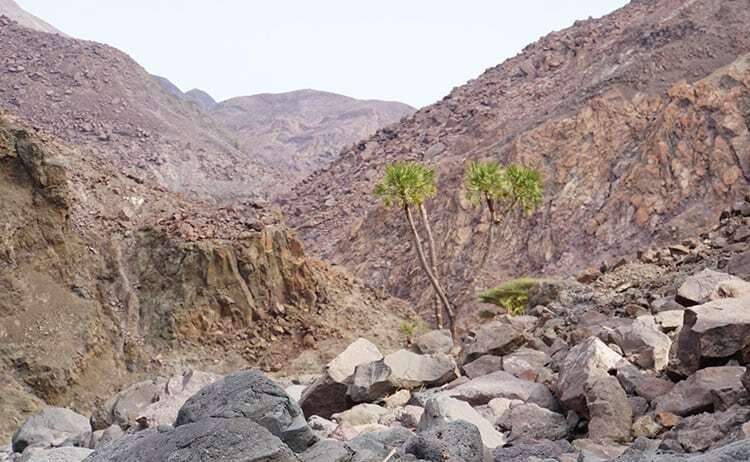 There is no mud at Lake Assal, it’s purely salt plans surrounded by volcanic landscape around it. Thank you for the compliment about my site!